← Crimbo click – how low can we go? I’m afraid that the first half of the year has vanished without me even getting round to writing up an analysis of the energy use over Christmas, as promised. 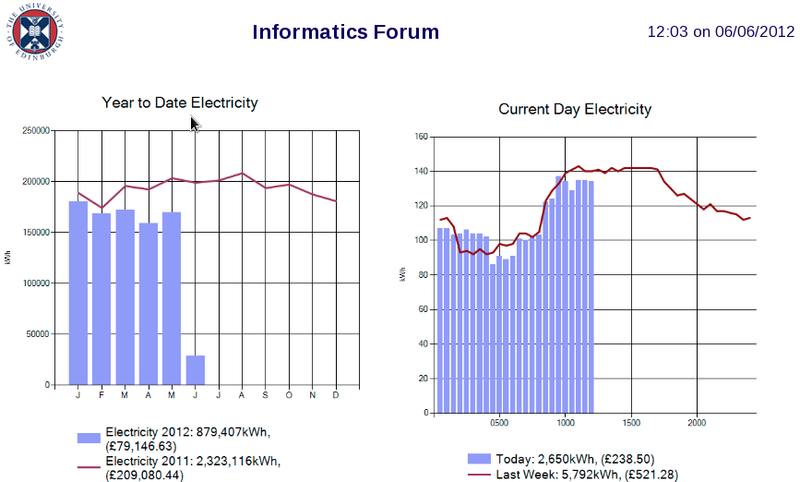 I will try to do this later, but for now, here’s a link to a live display of the Forum’s energy use. Hopefully this is going to be displayed on the screen at the entrance of the Forum. I think a few tweaks to the alignment of the graphs would be good – any comments you have would be welcome. I’ll pass them on to Dougie Williams from Estates and Buildings, who has been working with various schools to get similar displays installed. It looks as though we’ve been using at least 10% less energy in the past few months than we did at this time last year. 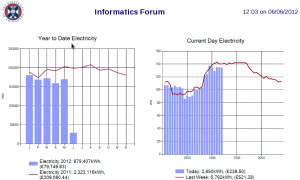 Festive switch-off | Informatics Energy Blog on Crimbo click – how low can we go?